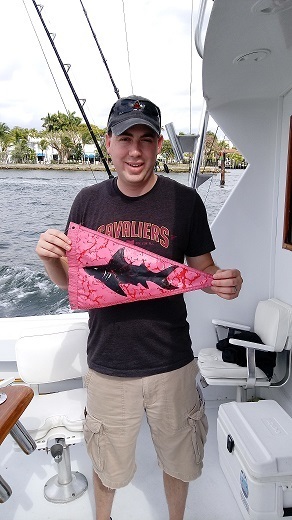 James Doglio and his son, Jim, from Ohio vacationing in Fort Lauderdale, FL were looking to spend some father and son bonding time, so they chartered the Topshotfishing team to do some deep sea big game sport fishing in Fort Lauderdale, Florida. As they boarded the boat, they were welcomed by the Topshotfishing team and were asked the question � "What type of fishing are you interested in." Their response was any fish, but if possible, a Shark. Fifteen/twenty minutes after leaving the dock lines were in 120 ft. of water by the sea buoy in Fort Lauderdale, 1.8 miles from shore. If you venture off another � of a mile you will find yourself in 500 ft. of water due to the extreme drop off in Fort Lauderdale. We started out trolling with two #8 plainers down, one with a 3 � blue reflector drone spoon and the other with a pink and blue sea witch in front of a double hooked Bonito strip. For surface baits, we went with two Ballyhoos and two Bonito strips. We trolled south towards some of our 34 artificial wrecks here in Fort Lauderdale. Our first strike was a Kingfish caught by Jim. From there we kept trolling south towards the Tenneco wreck, an artificial reef that was created back in 1985 when the Tenneco Oil Company sank five large sections of oil production platforms. While trolling in this area, we had four swings and misses. It was now time to do some Shark fishing. We moved out to 350 ft. of water and put out three Shark baits � one surface, one midrange and one bottom. After a 40 minute wait, a Hammerhead Shark made his appearance as he attacked the surface bait � the fun began!!! James was our angler and hopped into the fighting chair to enjoy the fun, while Dave, our mate, retrieved the other Shark baits. After a twenty-five minute battle, James brought the Hammerhead Shark, estimated at 100 lbs., for picture taking and release. With a smile on the anglers' faces, it was now time to head back to the dock. The anglers retired into the a/c salon and enjoyed the relaxing trip back to the dock at Bahia Bar located at 801 Seabreeze Blvd. Fort Lauderdale 33316.